Actress and singer of the stage and screen who earned a Young Entertainers Award (YEA) nomination for her part in the soap opera General Hospital. She won a YEA as part of the ensemble cast of the TV movie Dolly Parton's Coat of Many Colors. She has performed on stage in numerous productions put on by Creative Kids Youth Theatre where she trained growing up. 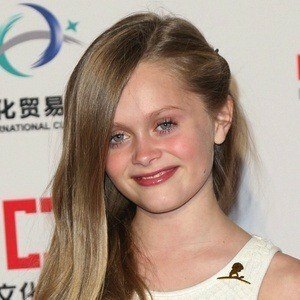 She was cast in the lead role of Olive in the off-Broadway Second Stage Theatre production of Little Miss Sunshine. Her father Tom is a film editor and her mother's name is Karrie. She has an older brother named Ryan. She reprised the role of Olive in Little Miss Sunshine that Abigail Bresman portrayed in the 2006 independent film of the same name.